A new café and brasserie from Corbin and King, the team behind The Wolseley, The Delaunay and Brasserie Zedel. Hipsters: prepare to be outraged. There’s a new kid in town, with dishes as retro as a Rubik’s Cube, but without the side of irony. That’s because it’s the latest gaff from Corbin & King, the chaps behind The Wolseley, The Delaunay, and Brasserie Zédel. Like those, it’s named in connection with classic cars (backstory: The Wolseley site was originally built as the showroom of the Wolseley Car Company). Bellanger is a nod to the Société des Automobiles Bellanger Frères, a French car manufacturer from 1912 to ’25 (fun fact: Monsieur Bellanger sold Delaunay cars). And once again, it pays homage to the golden era of all-day ‘grand cafés’. Formerly home to a popular-but-uninspiring branch of Brown’s, the site’s potential has at last been realised. The layout’s much the same (airy front section, intimate rear space, bustling middle to connect the two), but the refit by David Collins’s protégé Shayne Brady is all new. 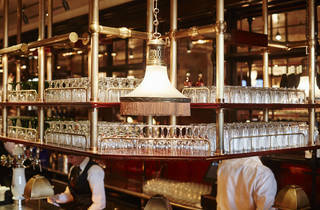 If you can call interiors straight from the Alsatian brasseries of turn-of-the-century Paris ‘new’, that is. (Bit of history: these were set up by refugees fleeing the Alsace after the region was annexed by Germany). It’s gorgeously art nouveau, all polished wood panelling, smoky mirrors and flattering golden lighting. An abundance of booths encourages group dining and café chatter. You can’t buy this kind of buzz. The food – a Venn diagram of French, German and Alsatian – is simple, yet flawless. If Angela Merkel and François Hollande embarked upon an illicit affair (please God, no), this would be where they’d eat. There was a mustardy prawn cocktail ‘up-luxed’ with crayfish, a crunchy-coated veal schnitzel beaten as flat as a kipper, and a buttery ‘coq au riesling’ – chicken in a mushroom and wine sauce – served in its own pretty casserole. There’s an irresistible nostalgia across the dessert list, from our dinky black forest gâteau, to the moreish crêpes suzettes: a couple of warm folded pancakes dressed with a grand marnier sauce, grated orange zest and a scoop of vanilla ice cream. Portions are generous, so for the best value, come with friends and order less than you’d expect. Who knows, even those of you in the beard-grooming, cosmetic-glasses-wearing brigade might just love it. 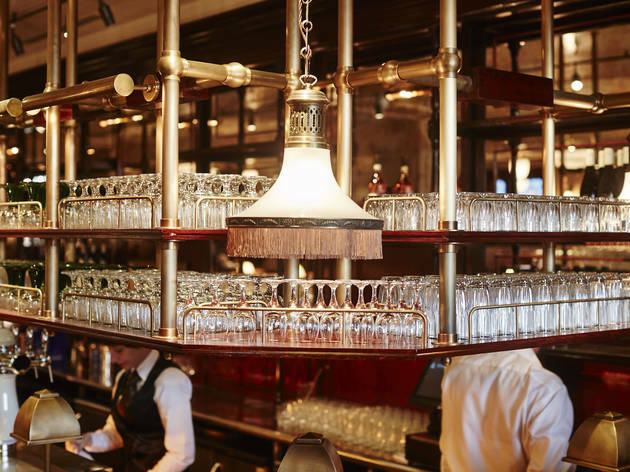 Bellanger is a traditional French brassiere and grand café in the heart of Islington, from the Corbin & King team behind The Wolseley and Brasserie Zédel. A relaxed, informal dining space and bar pays homage to the golden era of the grand café with its polished wood panelling, smoky mirrors and soft lighting. Live music plays every evening and there is an outdoor terrace overlooking the green. The food is inspired by classics from Alsace with French and German influences and menu highlights include Tarte Flambées and Coq au Riesling. Bellanger also hosts a series of events throughout the year, such as wine pairing evenings and beer tastings, as well as offering a number of packages with nearby exhibitions and local theatres. Starting with typical breakfast viennoiserie, waffles and egg dishes, and moving onto salads, sharing pots and escalopes, Bellanger's brunch is served every Saturday and Sunday & Bank Holidays until late in the afternoon. Throughout the day until late at night, we are open for a large selection of pâtisseries, gateaux, mignardises and biscuits, accompanied by a variety of coffees, teas and drinks. Join us from 5pm every Tuesday and Wednesday & enjoy our new mid-week evening specials. On Tuesdays, flat iron steak served with béarnaise sauce, frites & a gem heart salad with a carafe of wine is just £19.75. On Wednesdays, enjoy a choice of 2 sausages with homemade sauerkraut & potato salad & a Meteor bière for just £14.50. Reservations are not required. With its grand interior and 5* service, Bellanger makes a real occasion of a brunchtime (when I visited), and it’s also open for lunch and dinner, with breakfast soon to follow! Such a classic establishment, suitable for whoever you may be rendezvousing with, be it friends, dates, people “with kids now”; I can see it being a particular hit with the distinguished kind as there’s no queuing, has a well-spaced dining room, lovely toilets, serves wine in wine glasses, exceptionally polite service, and a classic menu. “So what with the food?” Wood paneling, smartly uninformed wait staff that say “my pleasure” when you thank them, and lovely little lamps, can only get you so far (quite far), but our tasty fare surpassed expectations, choosing a filling chicken salad, a grilled chicken paillard, and a couple of coffees, while complimentary bread and little chocolates with our coffees were small appreciated extras! Also, the lemon was so well styled, it had its own jacket!! Competition among authentic French restaurants in London is understandably high and Bellanger certainly didn't disappoint for a romantic date night. The decor, dining booths and helpful wait staff really set the scene for a Parisian-themed eve. We started with a recommended bottle of red, a heritage beetroot & goat cheese salad and a large sizzling platter of garlicky escargots. All plates were mopped up clean with the fresh bread and butter basket. I enjoyed a seasonal plate of seared scallops with pea purée and my partner indulged in the more traditional steak-frites, the portioning of scallops was a little thin for the asking price but I honestly didn't mind given that I had dessert on the brain! Unfortunately the tarte flambée wasn't at all what I was expecting, and I had already been forewarned that it wasn't the flaming cake that usually comes to mind. It was essentially a very large and thin pizza base with a thin spread of a sweet, fruit topping and a dash of cream. I can only imagine that it's a traditional and regional recipe but it was quite a stodgy and unsatisfying end to an otherwise beautiful meal. I'd recommend trying something else! Dining in Bellanger is like spending an evening in the loveliest French bistro but without the need to travel first on the sticky-finger-windowed Eurostar. If you’re lucky enough to live in Angel, chances are that you’ll find this petit slice of Parisian ambience is little more than a slow amble from home thanks to its perfectly central location on Islington Green. It’s not just that the atmosphere is gorgeous with the sort of low-key-lighting and gentle-piano-playing that really can’t fail to put you in the mood for love and it’s not just that the excellent food is matched by delightful service, it’s that the whole experience here is utterly charming. Sit at the front of the vast dining floor and watch the world go by at one of the al fresco tables – the ideal spot methinks for Sunday croissants & Sunday papers, thick with salted butter, jam, scandal & gossip respectively – or bag a booth towards the back and make candlelit eyes at the one you love. Counter dining is one of my favourite ways to eat and the bar here is impeccably suited to this, stretching nearly the length of the restaurant, shaded with darkly warm wood & gleaming crystal and amply packed with a who’s who of the grape & grain world. There’s a cracking value set menu available every day from 11.30am-6.30pm with 2/3 courses for £16/18.50 but the a la carte menu is where you can really indulge all your deepest, darkest Francophilian fantasies. Snails & rillettes sit alongside Toulouse sausages & coq au Riesling (one of three dishes perfectly designed for sharing) but like Hannibal Lecter, my heart has always belonged to raw meat although unlike him, I prefer mine spiced, minced & topped with egg yolk. Beautifully flavoured here and capped with the sweetest sphere of yellow, this is a first-class version of every carnivore’s dream. Servings are generous here I thought affably as I scraped the plate clean of the single serving starter I could easily have shared yet still polished off quite nicely on my own…portion control has never been one of my defining characteristics. Bless me and my unsuspecting stomach…we had no idea that the world’s largest schnitzel was about to arrive. Seriously. I’ve seen smaller airplane hangars. Was it good? It was absolutely delicious especially when forked up with sweet lingonberry jam, tangy sauerkraut & raclette mash in possession of the silkiest texture a potato has ever known. Was it too big? Well it stopped us ordering dessert so you decide. Hindsight at the dinner table is an amazing thing – had we been particularly un-French for a moment, we would have asked for doggy bags and considering we’d already picked out pudding, I kind of wish we had. I’m not sure why Bellanger serves schnitzels big enough to warrant their own platter – and probably post-code – but I’d have been more than happy with less than half followed by the black forest gateau, apple & calvados crepes and nougat ice-cream sundae that I’d earmarked. Told you portion control was a foreign concept pour moi. They’ve not completely done themselves out of a return visit from the mister and me – we’re local and have already circled potential dates for dessert & nightcaps like a Great White stalking a chubby-cheeked seal – but if you’d come from afar, it would probably be a different story. If like me, you’ve been to Paris and left a piece of your enraptured heart behind when you left, this is exactly the sort of place that will make you feel as though you’re back in the land of fine wine & stinky cheese and if like me, you’re a lover of both, then that thought should make you very very happy indeed. Bellanger From the moment you pass through the double door entrance way, your swept into an all new dining era. The French grand cafe type surroundings with beautiful decor and lighting makes a perfect atmosphere to relax and chat amongst friends. Sit yourself at one of the many booths or opt for a more private dining experience either way you'll be made to feel very comfortable. If you aren't too familiar with the language like myself then deciphering the menu could be interesting. I suggest taking your time with it though as that's half the fun. The Escargot was one of the first things that caught my eye, and it's safe to say I wasn't disappointed. I also recommend the Les Pot to share amongst your party and pair with it the perfect wine. All that topped with friendly staff who are also suitable dressed, Bellanger would make a good addition to any foodies bucket list. Fabulous service and great food in a wonderful setting. Great addition to the scene at The Green. A much needed touch of class in Islington. Relaxed in a way only top-quality service can be. And beautiful. Lovely French restaurant with outstanding service and great value for money. One of my go-to place in Angel. Corbin & King do these things so well. Excellent service; very good, reliable Alsatian cuisine. It's difficult to fault. You know it's a smart restaurant when you want to take a photo of the toilets! This place is all dark wood lined interiors, mirrors, and waiters in tails offering impeccable service. I usually go for a more casual option myself, but my brunch buddies had chosen here, and it was a fun experience. They serve up a classic brunch menu of eggs all ways, plus lots of delicious pastries. Our Eggs Benedicts were perfectly made, with a rich and glorious hollandaise sauce on top. Not the cheapest of options in Angel, but for the feeling of being in an expensive restaurant it's well worth the extra fiver for your breakfast. Excellent food Great service...they didn't freak out when I asked for a fried egg on top of my tarte flambe. The best part, they allow dogs in!